AntiSpyware Pro bietet umfangreichen Schutz für euren PC. 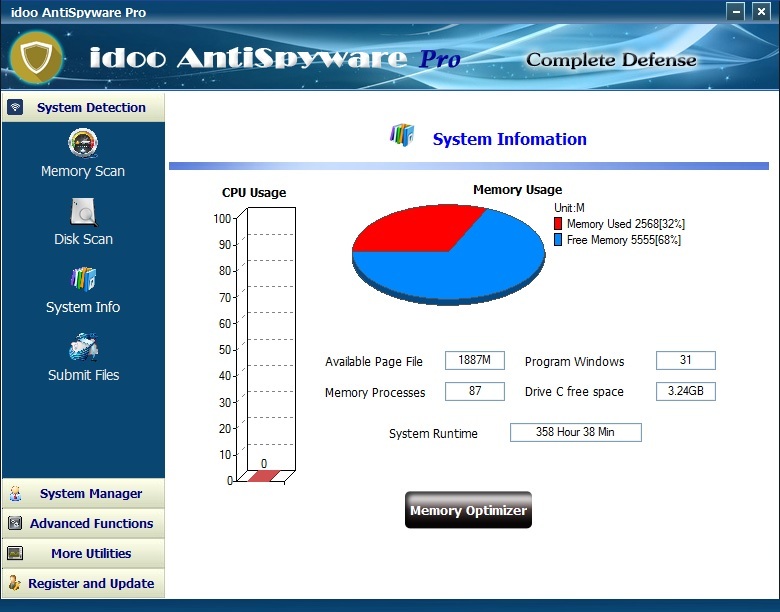 idoo AntiSpyware Pro war am 20. März 2016! als Giveaway verfügbar! AntiSpyware Pro bietet umfangreichen Schutz für euren PC. Mit seiner regelmäßig aktualisierten Viren-Datenbank erkennt es Trojaner und nicht autorisierte Programme - auch auf tragbaren Laufwerken und HDDs. Darüber hinaus bietet das Tool weitere Funktionen, die eurem PC zu seiner Höchstleistung verhelfen: Arbeitsspeicher- und Windows-Einstellungen-Optimierung, Erstellen von Backups und Wiederherstellen von Registries. Die Software beinhaltet kostenlosen technischen Support (support@idoosoft.com) sowie kostenlose Updates bis zum Ablauf der Lizenz. Bitte beachtet: Die Pro-Lizenz ist bis zum 30.06.2017 gültig. alternative Empfehlung, wenns schon kostenlos sein soll. Die wichtigste aller Fragen findet man natürlich wieder nirgendwo beantwortet: Kann ich dieses Programm als Zusatzsoftware zu meiner Security Suite nutzen, oder gibt es Kompalitätsprobleme, wie beim gleichzeitigen nutzen zweier Antiviren-Programme? BugsyMcBugs, Hat sich sowieso erledigt. Wird schon vom Browser blockiert. Wegen Virus- oder Spywaregefahr. Gratis ist ja ganz schön und gut, aber so einen (gefährlichen) Schrott ungeprüft anbieten.......? BugsyMcBugs, Hat sich sowieso erledigt. Wird schon vom Browser blockiert. Wegen Virus- oder Spywaregefahr. Gratis ist ja ganz schön und gut, aber so einen (gefährlichen) Schrott ungeprüft anbieten.......? RIndskopf, geh mal auf die Seite von Adobe, da kriegste es ohne Schadsoftware! Keinerlei Hintergrund Infos. Selbst google hat keine große Ahnung. Wer steckt dahinter? Welche Engine wird benutzt? Wer ist Ben Wells? Das Tool ist voll gepackt mit vielen anderen Dingen, was ein Antispyware Prog. nicht nötig hat. Habs installiert, probiert. Und wieder installiert. Wenigstens das funzt. Keinerlei Hintergrund Infos. Selbst google hat keine große Ahnung. Wer steckt dahinter? Welche Engine wird benutzt? Wer ist Ben Wells? Das Tool ist voll gepackt mit vielen anderen Dingen, was ein Antispyware Prog. nicht nötig hat. Habs installiert, probiert. Und wieder installiert. Wenigstens das funzt. The Tool looks a bit old fashioned in design, however, functions as declared. It works with other similar installed software. Shall know better later maybe. The Tool looks a bit old fashioned in design, however, functions as declared. It works with other similar installed software. Shall know better later maybe. Vorsicht !! AntiVir schlägt Alarm bei der Installation dieses Programms. Die Pro-Lizenz ist bis zum 30.06.2017 gültig. Kann man diesem tool trauen? Ich jedenfalls nicht. Vielen Dank und weiter geht es! wo liegt genau das Problem,, die Software ist ja bis Ende Juni 2017 gültig. Jotalicious, wo liegt genau das Problem,, die Software ist ja bis Ende Juni 2017 gültig. I have never hear of this product which seems to be an entire security solution including a firewall... Questions are what AV is it running & what firewall? Where does it stand in AV tests? Does anyone know if its any good at all in detection or will it slow your system? Can it be used with another trusted AV.. or is it a stand alone security that should not be used with any other? Some can be. Well what a totally useless offering it is today. Google blocks the website and won't allow the download. Tried to IE (yes, yes I know it's crap but any port in a storm) and this time Norton blocked access to the site and deleted the download as being potentially harmful ... I find it rather ironic that software that is supposed to protect your PC from the nasties is being detected as being one itself. Had to check date thought I might have overslept and it was 1st April. Now to go and waste my time doing something useful. Attackers on files2.giveawayoftheday.com might attempt to trick you into installing programs that harm your browsing experience (for example, by changing your homepage or showing extra ads on sites you visit). so many players currently exist in this sector that only those which have been tested are worthy of consideration. As that list shows, AVComparatives -- far and away the best research resource of its type -- hasn't even heard of idoo, still less examined idoo AntiSpyware Pro to see if the developer's claims are credible. Thanks, then, GOTD, but no thanks. Today's developer does itself no favours by being so cavalier in describing what it thinks it is doing with this product; absent external AV analysis and verification, idoo AntiSpyware Pro is going to appeal only to those who trust where they cannot see. . .
Aside from some evident confusion over just what this software protects against -- Trojan <i>virus?</i> Oh really? -- there's the rather more important fact that it seems never to have been crash-tested anywhere. That's a serious obstacle to idoo AntiSpyware Pro bedding in on anyone's computer, and one which the developer would be well advised to address as a priority because as this list demonstrates: http://www.av-comparatives.org/av-vendors/ so many players currently exist in this sector that only those which have been tested are worthy of consideration. As that list shows, AVComparatives -- far and away <b>the</b> best research resource of its type -- hasn't even heard of idoo, still less examined idoo AntiSpyware Pro to see if the developer's claims are credible. Thanks, then, GOTD, but no thanks. Today's developer does itself no favours by being so cavalier in describing what it thinks it is doing with this product; absent external AV analysis and verification, idoo AntiSpyware Pro is going to appeal only to those who trust where they cannot see. . . I tried a Quick Scan (98,812 files) and found 0 threats. This concerns me as I have the full package of Nirsoft Utilities. About 6 of these programs are password retrievers and I have to exclude this directory for other spyware, malware and/or anti-virprograms. 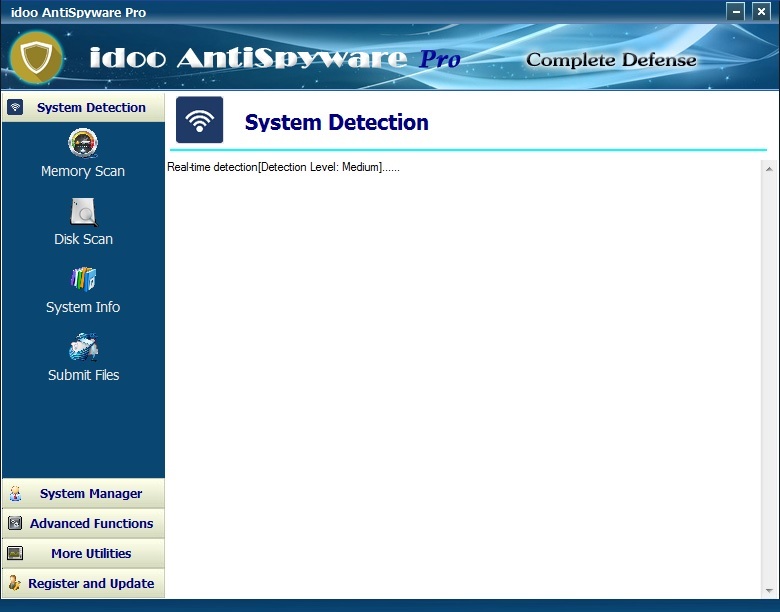 Even though they are false positives, idoo AntiSpyware Pro did not detect any problems. My AVG Anti-virus identified bulletspassview.exe as HackTool.ancc. It identified chromepass.exe as HackTool.ASTW, dialupass as HackTool.AKLV and so on. My anti-virus detects 13 threats from the Nirsoft folder. 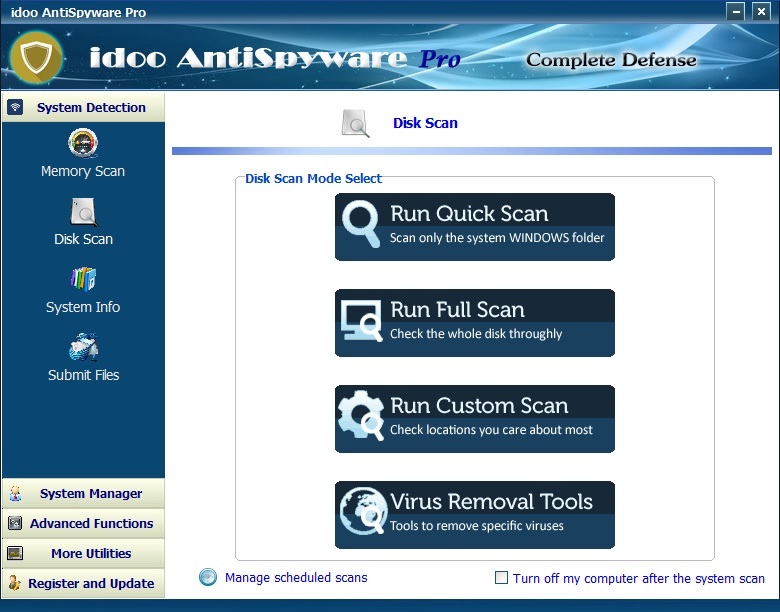 idoo AntiSpyware Pro detects 0.
idooAS.exe and update.dat are added to the firewall rules. My AVG just popped up identifying update.dat as potentially dangerous. I'll post back after further testing. Installed perfectly on my Windows 7 Pro 64-bit. I did temporarily disable my anti-virus protection because programs don't install correctly due to GOTD's software wrapper (setup.exe) I tried a Quick Scan (98,812 files) and found 0 threats. This concerns me as I have the full package of Nirsoft Utilities. About 6 of these programs are password retrievers and I have to exclude this directory for other spyware, malware and/or anti-virprograms. 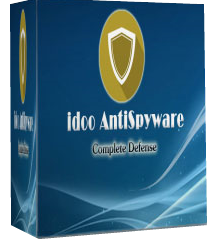 Even though they are false positives, idoo AntiSpyware Pro did not detect any problems. My AVG Anti-virus identified bulletspassview.exe as HackTool.ancc. It identified chromepass.exe as HackTool.ASTW, dialupass as HackTool.AKLV and so on. My anti-virus detects 13 threats from the Nirsoft folder. 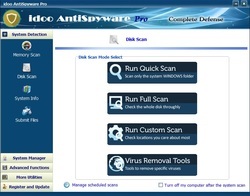 idoo AntiSpyware Pro detects 0. idooAS.exe and update.dat are added to the firewall rules. My AVG just popped up identifying update.dat as potentially dangerous. I'll post back after further testing.